As we know currently we can book gas refill through different ways like- visiting to the gas agency,using IVRS facility and through SMS. 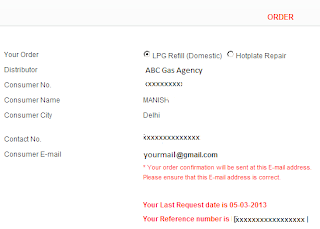 Now gas agencies are also providing the facility to book the refill or apply for new connection through online. 1. Open the Indane Website. 2. 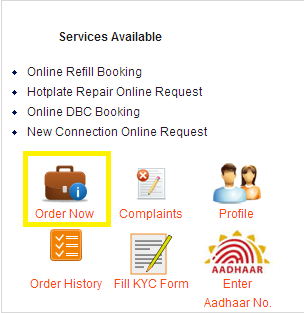 Enter your User Name and Password on Customer Login section. 3. Click on "Order Now" link on Welcome Page. 4. Order pages comes, Please click "Submit" on this page. 5. 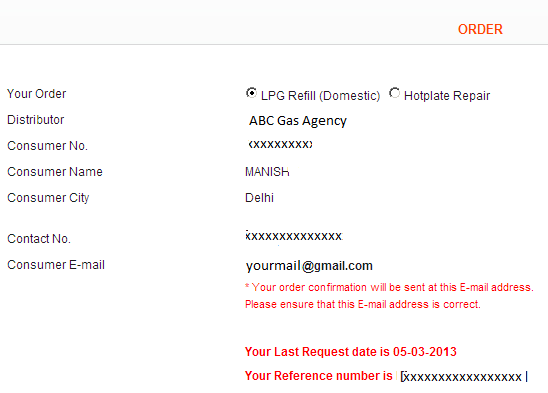 Now "Order Confirmation" page will come that will confirm the order and display the reference number. 6. After this Indane will send the final confirmation mail to our registered email address.